Welcome back to Misan[trope]y Movie Blog! 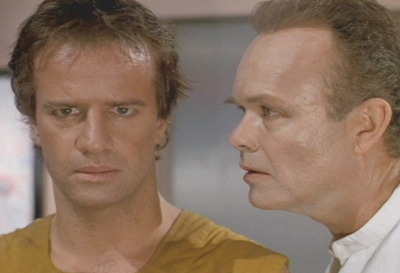 Next up in the two week Stuart Gordon spotlight is “Fortress,” a 1992 Australian sci-fi flick starring the Highlander himself, Christopher Lambert. 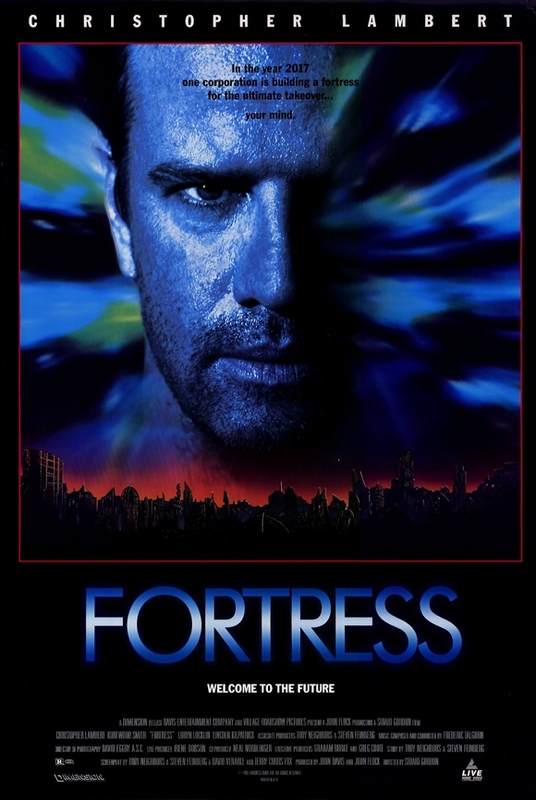 “Fortress” marks one of the rare occasions where Stuart Gordon didn’t have any writing credit: he strictly directed “Fortress.” That is probably a good thing, because judging from the listed credits, there were already plenty of writers involved with the screenplay. The initial story of “Fortress” is credited to both Troy Neighbors and Steven Feinberg, who share an initial screenplay credit with a third collaborator, David Venable. Following that, there were apparently re-writes done by Terry Curtis Fox, a scarce television writer who shares an additional (but separate) writing credit on the film. Judging by how the gymnastics sometimes go regarding writing credits on films, I wouldn’t be shocked to learn that plenty more hands were involved as well, but were left off of the final listing. I would be even less surprised to learn of some phantom writer on the project given the combined inexperienced of all of the listed writers involved. The cinematography on “Fortress” was provided by David Eggby, a particularly well-regarded director of photography in Australia, who has extensive work on sci-fi features such as “Mad Max” and “Pitch Black” to his name. Frédéric Talgorn returned to do the music on “Fortress” after contributing the excellent score to a previous Stuart Gordon movie, “Robot Jox.” Despite not being quite as memorable as the one he did for “Robot Jox,” the score to “Fortress” is certainly good, though perhaps unremarkable. “Fortress” was distributed by Miramax’s Dimension Films in the United States, which was Bob Weinstein’s sub-division of the highly successful company. Dimension has historically focused on high profit-potential horror and sci-fi films, and “Fortress” was no exception. Interestingly, the Weinstein brothers retained the Dimension label when they ultimately jettisoned Miramax, and incorporated it into the current powerhouse that is the Weinstein Company today. There is a lot to say about the effects in “Fortress.” There is certainly lots of gore and squibs to go around, which pushes the cheese limit on the flick. 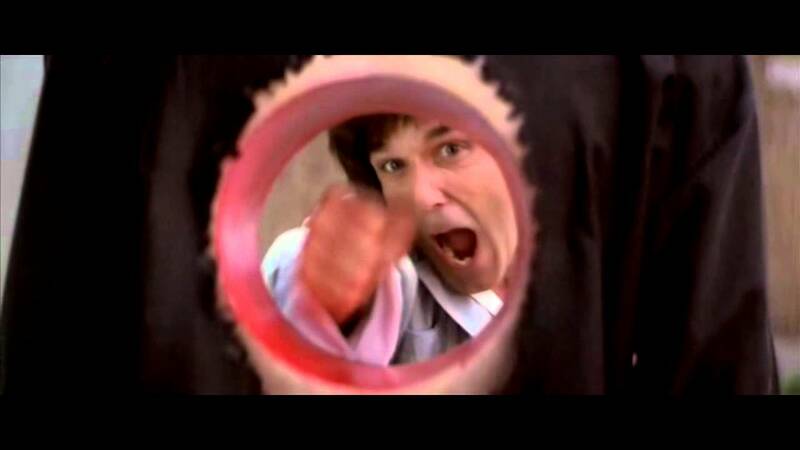 In particular, there’s a sequence where a guy has his entire stomach blown out, to the point where there is a complete and perfect hole that he can put his hand through. I’m pretty sure that was a gag in “Kung Pow: Enter the Fist,” which puts “Fortress” at the Rubicon of turning into self-parody. In spite of that, it never quite crosses that river in such a way as to lose the audience entirely, at least not in my opinion. Something absolutely worth noting about “Fortress” is that the cyborgs and gadgets all look pretty damn cool, and fit in fantastically with the general set design (which is also top notch). That might seem like a basic thing, but I’m sure there are plenty of ways where this could have gone wrong. Practical effects are all over the place, which is a good practice for this kind of film. All of the sci-fi devices are believable and tangible, and nothing is completely ridiculous. Even the internal detonators placed in the prisoners are pretty simple explosives from the look of them. Speaking of explosives, there are also a couple of fantastic, classic explosions throughout the movie that action movie fans are sure to get a kick out of. 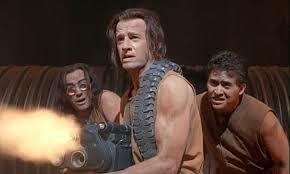 Outside of Christopher Lambert, the cast of “Fortress” includes a handful of recognizable faces, including Stuart Gordon favorite Jeffrey Combs and Kurtwood Smith of “RoboCop.” Character actor Clifton Collins, Jr. appears in an early role for him, before dropping his initial stage name of “Clifton Gonzalez Gonzalez,” which he bore in honor of his grandfather, the actor Pedro Gonzalez Gonzalez. 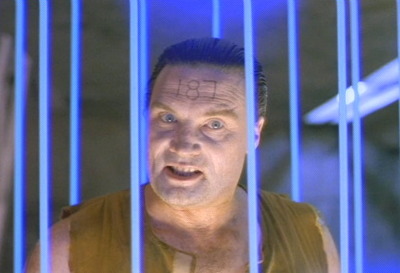 The voice of the prison computer system is voiced by none other than Carolyn Purdy-Gordon, wife of Stuart Gordon and frequent antagonist-figure in his films. Other notables in the cast include Vernon Wells as a heavy inmate and Lincoln Kilpatrick as an aging prisoner facing parole. The plot of “Fortress” follows a couple attempting to have a second child after an initial failed pregnancy. 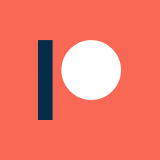 However, the dystopian future they live in (2017 United States, hilariously) operates on a strict one-child policy, meaning that they must attempt to cross a border out of the country without their pregnancy being detected by authorities. Unfortunately, they are caught at the Canadian border and sentenced to incarceration in an underground super-prison, where their child is to be confiscated upon birth. Lambert’s character tries to survive the hazardous world inside the prison, while also searching for a way to escape with his wife and unborn child before the out-of-control prison company can claim all of their lives. “Fortress” made $46 million total on an estimated budget of $8 million, making it a significant financial success. However, it currently holds an IMDb rating of 5.8, a Rotten Tomatoes audience score of 48%, and a critic rating of 40%. Personally, I feel like these scores are a bit deceiving, as is the case with any film that falls within the good-bad aesthetic. Just at a cursory glance, some of those negative reviews acknowledge how fun the movie is, but give it a low score nonetheless. Once again, as I have found with many critics’ reviews of Gordon’s movies in the past, I saw many that compared “Fortress” to Gordon’s earlier works, specifically “Re-Animator.” “Fortress” is very clearly a different kind of movie than “Re-Animator,” without any connection to the horror genre or Lovecraft, and Gordon wasn’t even involved in writing on “Fortress.” So, why on Earth would it be anything like “Re-Animator,” outside of a handful of stylistic and casting choices? It boggles my mind how some critics can’t separate the past and the present for directors and writers. I guarantee that someone out there is writing a review of “Maps To The Stars” right now complaining about how it isn’t “Videodrome” or “Eastern Promises.” You can’t ignore the body of work of a creator when writing about a new feature, but basing an entire review on it is beyond unfair. As far as actual criticisms go, I saw a fair number of complaints about Lambert’s acting abilities. Personally, I don’t find him that distracting in general, though his accent is always pretty heavy. I usually enjoy his performances when he pops up in things, and “Fortress” is no exception. He isn’t a dynamic actor by any means, but he is pretty solid at the few character types he plays. There are some good imaginative sci-fi elements to “Fortress” that are based on real social issues of the time: issues like the privatization of prisons, social anxieties on overpopulation, the institution of one-child laws, the use of technology in surveillance wiping away privacy, the replacement of humans by more efficient robotic workers, etc. 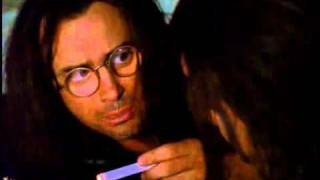 As far as performances go in “Fortress,” it is impossible not to mention Jeffrey Combs. He is once again solid in his supporting role, and is nearly unrecognizable with his long hair, massive lenses, and hippy-ish dialect. Also deserving of commendation is Kurtwood Smith, who is one of the best movie villains out there, period. I’m surprised he hasn’t gotten more opportunities to show it off over the years. He is incredibly memorable in “Fortress,” almost as much so as his most highly regarded role in “RoboCop.” It is just hard not to love a creepy, evil prison warden trying to get in touch with his humanity. There are a couple of well-executed twists and fake-out in “Fortress” that make it particularly memorable in my opinion. I really like the twist of what the government does with the “extra” children conceived outside of the one child limit. Cyborg experimentation sort of ties into aspirations of transhumanism, which is alluded to at points through dialogue as a way of dealing with overpopulation: the goal is to create a non-sexual, immortal cyborg population that will be able to sustain on the planet. It is also fun to see how the cyborg played by Smith condescends to his computer, looking down on the entity that represents a part of him that he comes to loathe. He clearly desires to be more human, and takes the frustration out on his computer. Speaking of which, the computer gets a glorious act of revenge with an outstanding death for Smith. The ending sequence, which was apparently omitted from some versions of the movie, also features some bit I really enjoyed. There is a little bit of “Maximum Overdrive” thrown in at the last minute, which leads to a spectacular final explosion and one of the cruelest fake-out non-deaths you can imagine for the conclusion of a movie. Lambert’s reaction shot to the explosion is also hilarious, but I unfortunately haven’t been able to dig up a clip of it. This is one of the few Stuart Gordon movies that I had not seen before this retrospective, and I was pleasantly surprised by it. Most of what I had heard was that it failed to live up to his other, more memorable works. However, I think this deserves consideration towards the top of the list for his career. I feel about “Fortress” what I expected to feel about “Castle Freak,” which is the opposite of what I was led to believe before watching them. “Fortress” is an absolute blast of a movie with some great sci-fi and action elements, hammy performances, cheesy / squibby effects, and a fun concept at the core. I think this movie generally deserves a second look, because I found an awful lot to like about it. If you are looking for a fun flick for a bad movie showcase, I think “Fortress” will certainly fit the bill to your satisfaction. 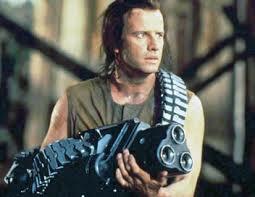 I mean, it is a sci-fi prison break movie featuring Herbert West, Connor MacLeod, and Clarence Boddicker. What about that isn’t to love?